The SaaS HRMS market is growing as more HR and applications delivery professionals recognise the need to move to more agile and engaging HR systems. SaaS has been accepted in HR as the deployment model of choice, and vendors leverage SaaS to deliver more rapid innovation in processes and user experiences. 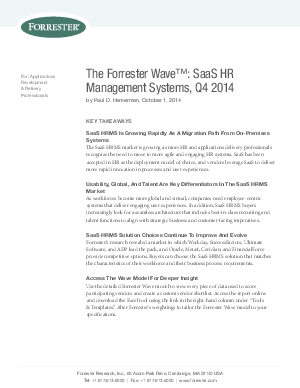 This report shows how companies can select the right SaaS vendor for their human resources management needs.